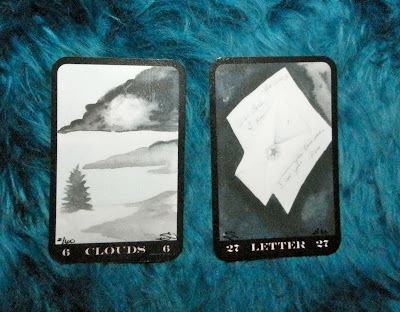 Today's Draw: Clouds and Letter from the Indigo Payne oracle from Beth Seilonen. Are you getting clearer and clearer messages from spirit and don't know what to do about it? Are you getting messages that you're not sure are messages? What "ghost stories" do you have to tell? It's rare I open up a deck of cards from the mail and am overcome with emotion. In fact, it pretty much never happens. But today I got a Lenormand oracle I had wanted for a while, not because it was hip or cool, but because of the journey it goes on and the story it tells. Beth Seilonen is more than just a highly prolific deck creator (upwards of 80 tarot and Lenormand decks, I'm guessing), she's someone I consider a friend. And last February she lost her stepfather, Ron Hatton, a man she considered to be her father. He was an art buddy and friend to her. So she took his loss hard and coped the only way she knew how. Through art. Within the first 24 or 48 hours after his death, she created this deck in his honor. It is dark, emotional and moving. So it arrived today in a velvety pouch, within a glittery pouch, within a gold box with a lily drawn on it. The deck was hugged, held tight and treated specially, just like Ron was. It came with a notecard depicting a winged fairy in pink. Ron drew the card image as part of challenge Beth gave him in the use of watercolor pencils. It is beautiful...more beautiful for having come with the deck. I don't say this lightly, because I'm not one of "those" kinds of new-agey people. But the entire package carried such powerful, mournful, beautiful, raw and profound energy. I'm so glad she decided to share this deck with others and I'm proud to be one of her first customers. My deck is #2 of 60. So on to today's reading. This combo speaks of hidden, vague or confusing messages. And that's how our loved ones who pass communicate with us. The letter card, in this case, is literally a letter from Ron to Beth telling her he loves her. You can't see the whole message because the envelope covers it. 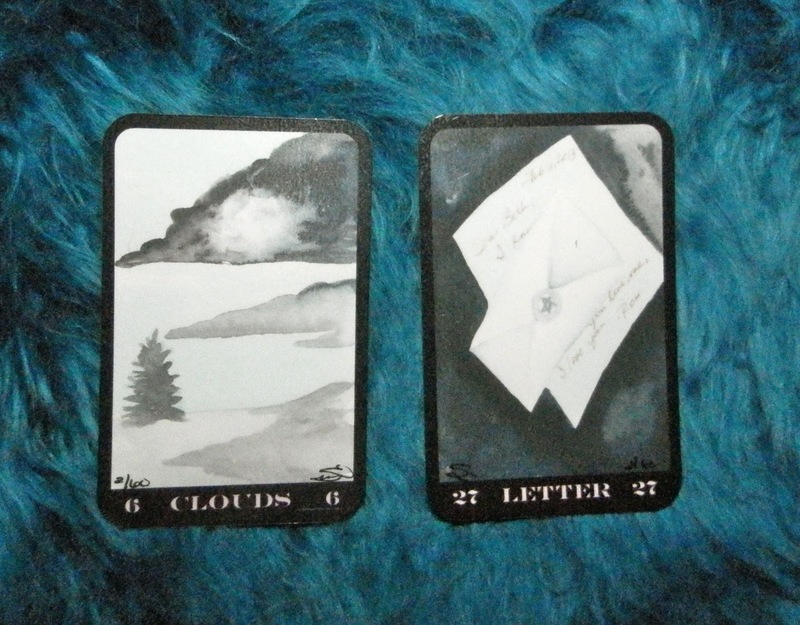 The influence of the cloud card obscures that message further, keeping us from seeing clearly. The cloud is akin to the veil between the spirit world and our world in my interpretation of this pair...just as a cloud is the barrier between us and the sun/the light, the veil/cloud is the barrier between us and spirit. For some, like Theresa Caputo, the Long Island Medium, the cloud is light and wispy. For most of us, though it can create quite a barrier. But see, this veil...the clouds...aren't nearly as thick as we believe them to be. We make them thick in our heads. By not believing. By not trusting. By second-guessing. Theresa Caputo is very talented and she has a undeniable natural gift. But we all have the capability of doing what she does if we work on it. It might always be easier or clearer for someone like her, but this is a capability we all possess and can develop...like a muscle you exercise with practice. So if you ever wonder about your deceased grandmother or spouse or child, chances are great they've been trying to communicate with you for a long time. But your own doubt forms the clouds that muddy the message. Did you find your deceased mother's necklace in a weird place at some point? Chances are she moved it. Do the lights flicker now that your best friend has passed? It's likely it's them. Do you suddenly smell gardenias in your house sometimes? That's grandma coming for a visit. They will come to you through all the five senses, and they're usually responsible for odd happenings around the house. My brother was a smoker who died of lung cancer. Ever since he's gone, my fire alarm has been acting up. My sister's has chirped for no reason, too. Around the time of his death, we were all seeing cardinals, even cardinals doing weird things. My brother was a loyal Cardinals fan. For years after my father died, I would suddenly smell cigar smoke in my home. All my siblings report this phenomena. I also had a patch where I kept seeing an MGBGT on the street where I now live...a very rare car from the 60s that he used to drive. I haven't seen once since that that one patch of time when I was buying my house in this neighborhood. I've also heard his voice in my ear, predicting something that eventually came to pass. After my mother died, my sister would literally feel my mother sit next to her on the sofa...the cushion would depress and everything. Other than that, I've "felt" the deceased staring at me, "heard" them like a distant cocktail party, felt them tug on my sheets as I'm in bed, "seen" them in the corner of my eye and even saw a cat ghost once, quite clearly. That's just the beginning of ways they make their presence known. Can you explain all of this away? Of course you can. And the more you explain it away, the thicker the cloud cover gets. As into this kind of stuff as I am, I'm a lot more skeptical than you would ever think. I question everything. But I'll say this, if we die and that's the end of things, no one will be more surprised than me. I've just had too many experiences, either personally or through mediums, to think any differently anymore. The term for someone who sees spirits and communicates with them well is "clairvoyant". It means clear seeing. I often joke that I'm a fuzzyvoyant (clouds + letter = fuzzyvoyant). I'm not remarkably gifted in this way and I have to work at it. But I'm also kind of lazy and not into it, so I've only gotten as far as fuzzy. Which is fine with me. I have other gifts I'm more "clair" with. But there are people who approach me now and again who were born "seeing". And, either because of religious reasons or fear, they shoved it down as best they could. The problem is, you can only do this for so long, because these gifts get stronger with age. So, whereas I need to practice and learn in order to see clearly, those people need to practice and learn so they can control their gift (and so their gift doesn't control them). When that happens, I always refer them to my friend Sheila because she teaches development teleclasses and will work with people individually to develop and control their gifts. On these teleclasses, you can be anonymous and learn more about what's going on in your head. Anyway, coming full circle, I think part of today's message is that Ron knew I would get a message to Beth that he's around and sending fuzzy messages...haha. But I also think it came for you. What weirdnesses are you explaining away? And what are your stories from the other side?